This section is dedicated to caricatures done by the likes of Julius Kroll, Oscar Berger and other illustration artists. The Kroll and Berger illustrations feature some of the finest, original work done on celebrities, politicians and other persons of fame. Many of the Berger illustrations are autographed by his "victim" as he liked to call them, and feature a one-of-a-kind signed portrait. 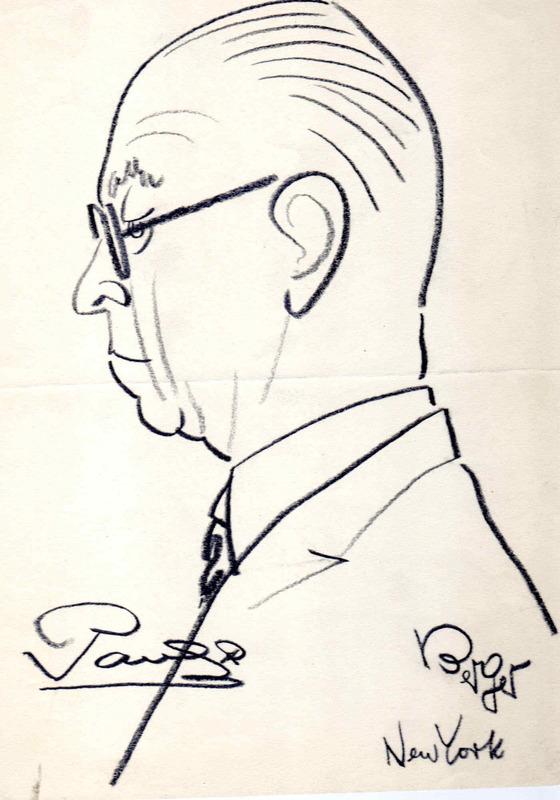 This is a wonderful, original caricature done by Oscar Berger of King Paul of Greece. This circa 1940s pencil portrait features King Paul with in a stately pose. Signed in huge lettering at left, fold at center, else in very good condition. Portrait is 9x12 inches, in overall very good condition. Would frame up nicely. 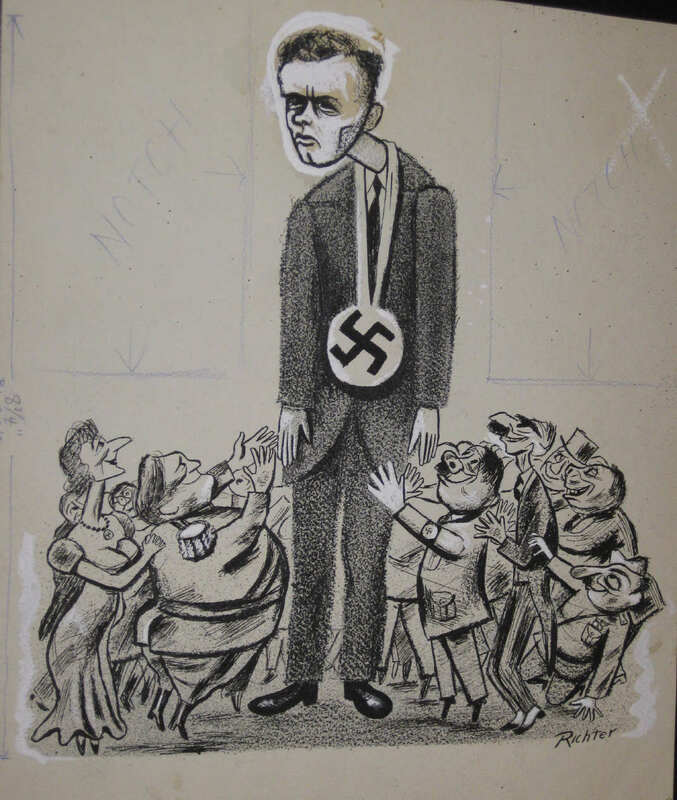 Oscar Berger (May 12, 1901 – May 15, 1997) was a well-known caricaturist and cartoonist. Berger was born in Prešov, Slovakia. He became a cartoonist in Prague and studied art in Paris and Berlin. In Berlin, he secured an assignment with one of the largest Berlin daily newspapers and was one of the few journalists admitted to the 1923 Munich trial that followed Hitler's abortive putsch. 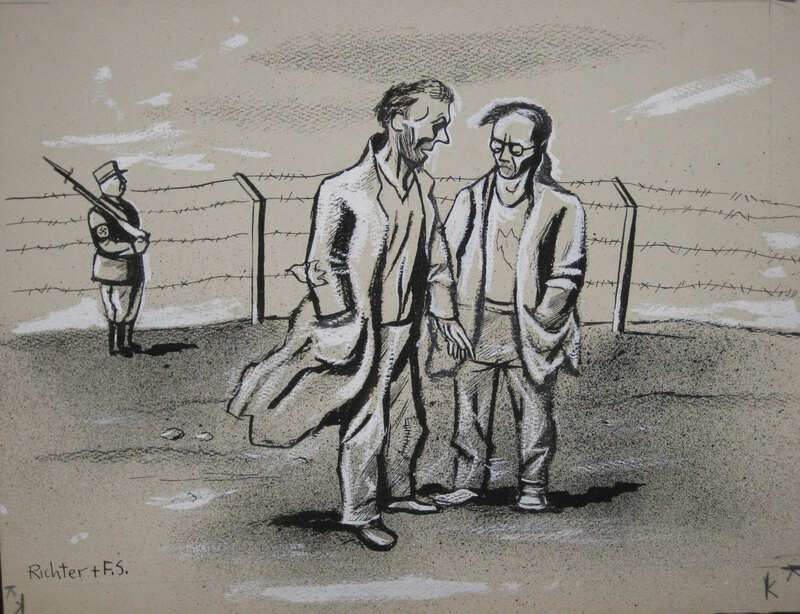 Later, when Hitler came to power, Berger's cartoons angered Hitler and Berger was forced to leave the country. He spent time in Budapest, Paris, and Geneva, where he attended numerous sessions at the League of Nations, and finally settling in London in 1935 where he worked for the Daily Telegraph. During the 1950s, Berger attended many sessions at the United Nations and illustrated virtually every important world leader to be seen at there. His work subsequently appeared in Life, the New York Times, the New York Herald Tribune and Le Figaro, among numerous other publications. Paul (Greek: Παῦλος, Βασιλεὺς τῶν Ἑλλήνων, Pávlos, Vasiléfs ton Ellínon; 14 December 1901 – 6 March 1964) reigned as King of Greece from 1947 to 1964. 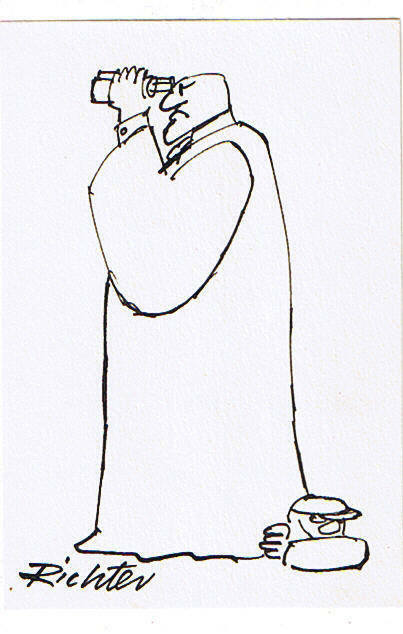 This is a wonderful, original ink, during the Nixon Watergate years showing a burglar in hiding , drawing is 4x6 inches, signed at lower right by Richter, overall fine shape. A longtime Provincetown resident, Mischa Richter, was born in Kharkov, the Ukraine, on Aug. 12, 1910. A proud and private man, Mischa remained at the top of his form often saying with a touch of octogenarian irony that he wanted "to die healthy." He continued to paint and think of ideas for The New Yorker until the very end. Mischa Richter, one of Provincetown's beloved icons, died on March 27, 2001 at the age of ninety. Mischa Richter was an American cartoonist. His work included the Strictly Richter comic strip, The New Yorker, and elsewhere. He received the National Cartoonist Society Advertising and Illustration Award for 1979, and their Gag Cartoon Award for 1974. This is a wonderful, orignal ink drawing on heavy duty art paper, done in the very early days of Mischa Richter's career. Drawing published January 24, 1941 in the 'PM' newspaper, on page two of paper. 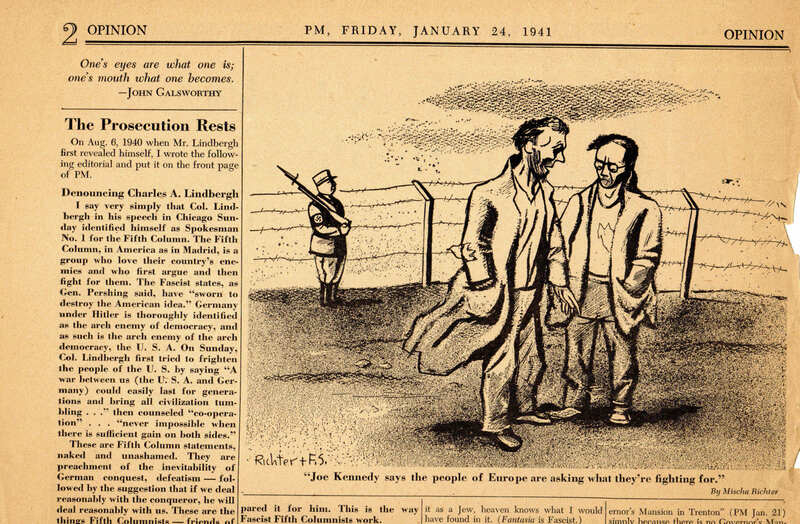 Drawing depicts two American P.O.Ws stating " Joe Kennedy says the people of Europe are asking what they're fighting for"....signed at left by Mischa Richter. Drawing is 11x14, overall very good condition. This is a wonderful, orignal ink drawing on heavy duty art paper, done in the very early days of Mischa Richter's career. 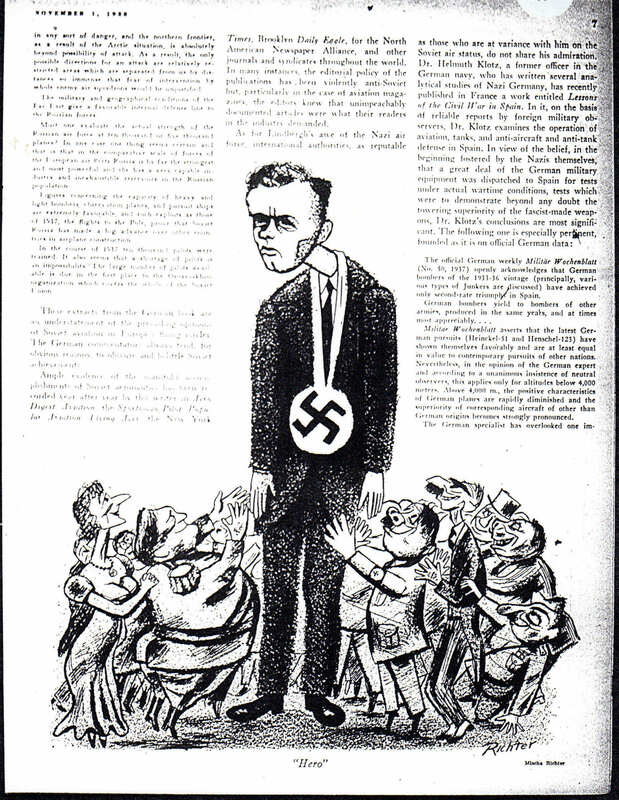 Drawing published September 22, 1939 in the 'New Masses' magazine, depicts Charles Lindberg in his fall from grace, having moved to Europe and backed the ideas of a German Victory in Europe. Artwork is 14x16, some ageing, else ini overall very good condition.